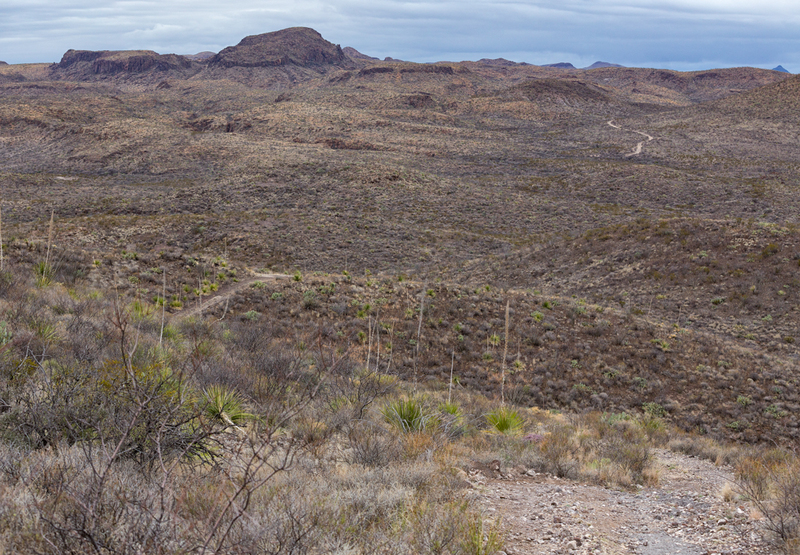 Big Bend Ranch State Park hugs the Mexican border and sprawls over 311,000 acres of the Chihuahuan Desert in West Texas. State park staff affectionately call it “The Other Side of Nowhere.” To the casual visitor, the park appears to be all rugged mountains, deep canyons, and miles and miles of rough roads designed to destroy your vehicle and shake the fillings loose from your teeth. But those rugged mountains and deep canyons hold treasures if you’re a naturalist. The rough roads? They’re just a necessary evil if you want to experience the park. I spend two days with Blaine Hall and Roy Morey exploring sites for a Native Plant Society of Texas field trip. Blaine aka “Big Foot” wears one shoe 3 sizes larger than normal to accommodate the brace and bandages that stabilize an ankle broken during a hike two weeks ago. Recently retired from his position as the interpretive ranger for Big Bend Ranch State Park, Blaine chatters away, teasing Roy and me, and pointing out geologic features as he skillfully guides the truck up rock-covered slopes, across ridges of limestone, and down sandy washes. He pulls over frequently so that we can enjoy the view. Roy is quiet, not letting Blaine’s teasing phase him. Roy is a plant person. After retirement, he moved to Terlingua and began compiling photographs of the plants of Big Bend National Park. 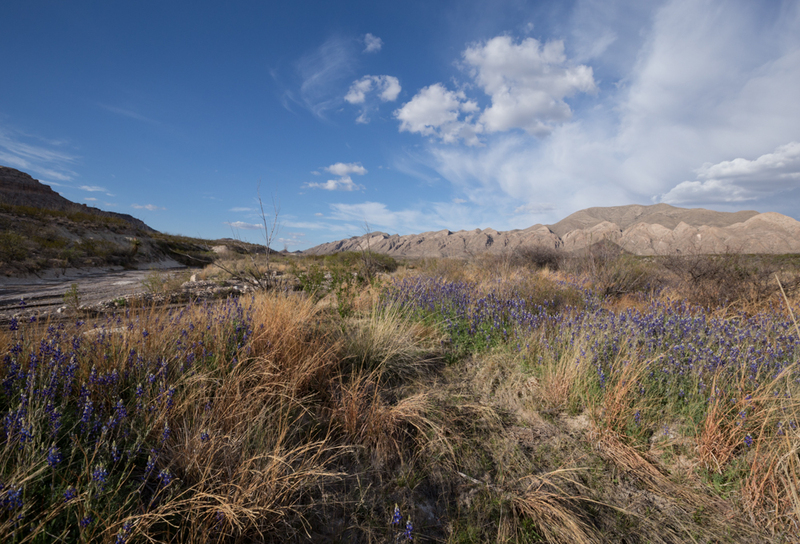 His hobby became a full-time pursuit, ultimately resulting in Little Big Bend: Common, Uncommon, and Rare Plants of Big Bend National Park. Once he completed that book, Roy shifted west and began working on a companion volume that will describe the plants of Big Bend Ranch State Park. “I need to get up there someday,” says Roy, looking up at the sheer cliffs of a mountain. I’m surprised. Between Roy and Blaine, I would have sworn that they’ve walked every inch of the park’s 311,000 acres. 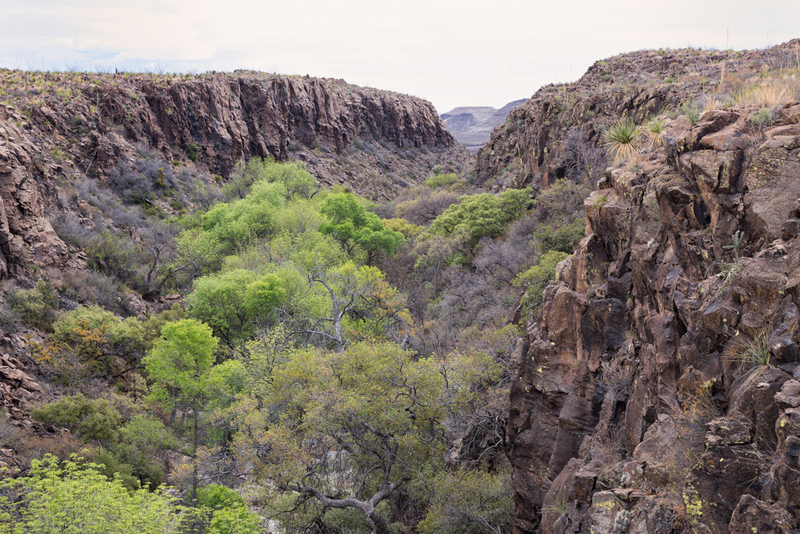 Today, we’re looking for unusual plants, so we head for Arroyo Mexicano, a box canyon that ends at Mexicano Falls. Canyons often harbor botanical treasures such as groves of cottonwood and ash trees and tiny plants that cling to the rock walls. Canyon walls protect plants from the harsh sun and fierce winds of the desert and often have seeps and springs that provide extra moisture. “One of the only mountain laurels in the park is up Arroyo Mexicano,” says Roy. “I hope it’s still alive.” It was. “Want to see an ammonite?” Blaine asks as we drive down Fresno Canyon. 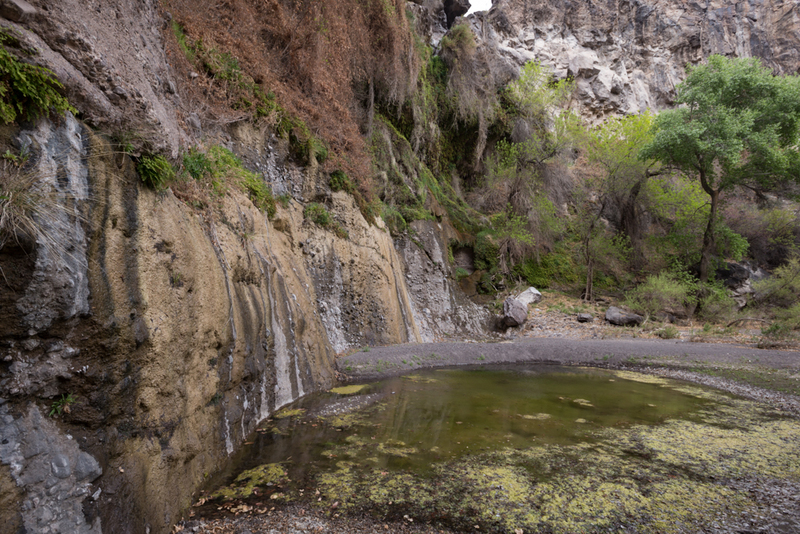 The creek has eroded deeply into the rock, exposing the flat-lying, flaggy Cretaceous limestone of the Boquillas Formation and the nobby, white limestone of the Buda Formation. We pile out of the truck to admire the dinner plate-sized ammonite lying exposed on an upturned piece of Boquillas limestone. 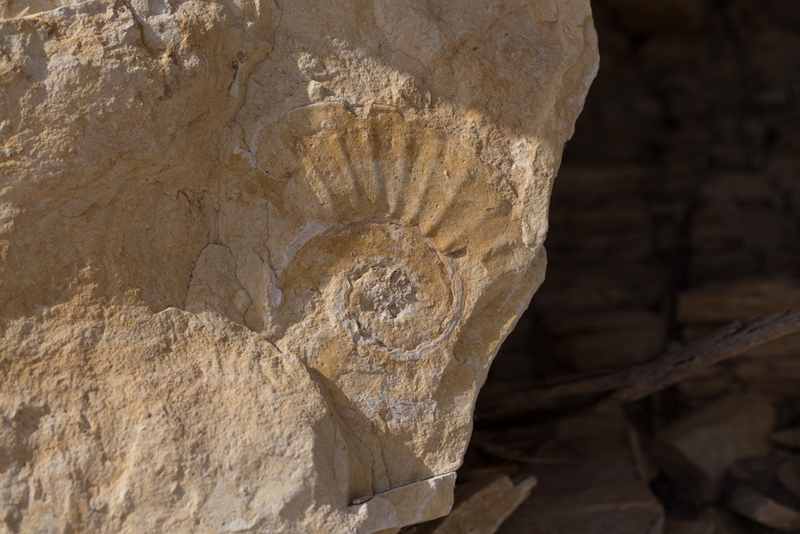 The thick limestones and this ammonite fossil are evidence of a time when a shallow sea covered part of Texas. You won’t see ammonites swimming around today. The last of them went extinct when a giant meteorite struck the earth about 66 million years ago. The short and long-term effects of the meteorite impact—wildfires, tsunamis, and clouds of debris that blackened the skies and blocked the sun for years—killed about ¾ of Earth’s plants and animals. We eventually arrive at the mouth of Arroyo Mexicano, shoulder our packs, and trudge our way up the canyon. I’d like to say that we hiked briskly, but I have to admit that I’m a trudger in soft sand. Fairly quickly, we see pools of water and a shallow stream meandering its way across the sand bottom. Groves of cottonwoods, their new leaves a beautiful, fresh spring green, provide shade along the way. Occasionally a spot of pink reveals the location of a Mexican buckeye tree. These early-blooming shrubby trees are an important source of nectar for bees and butterflies. A Mournful Duskywing flits between flowers, ignored by a nectaring Grey Hairstreak. I search unsuccessfully for a Henry’s Elfin—a small brown and silver butterfly that uses Mexican buckeyes as a host plant. Henry’s Elfins are more common in the eastern United States, so seeing one in West Texas is pretty special. Roy and Blaine have moved on, so I quit looking for butterflies and hurry to catch up. As we move up the canyon, we walk under large velvet ash (Fraxinus velutina) trees. I am fascinated by the texture of the bark and the thick, gnarly roots wrapped around giant boulders. Of course, the exposed roots are also a warning sign. 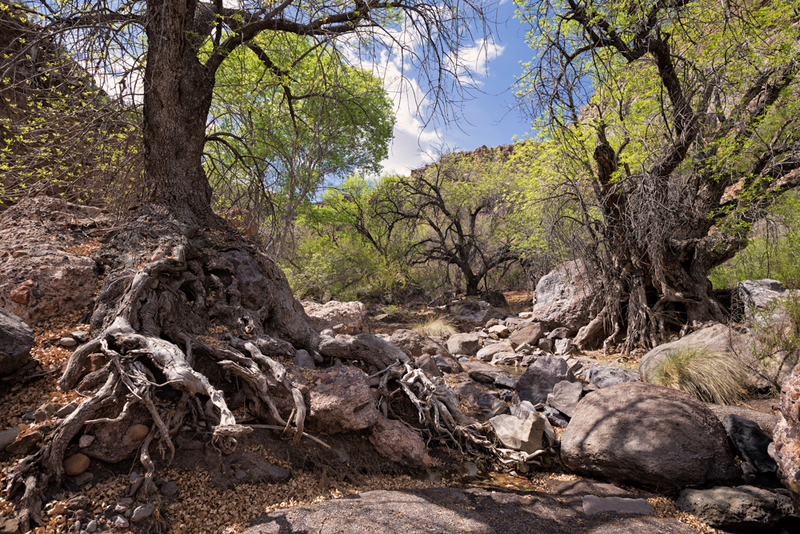 This canyon carries water—often with enough force to roll boulders and wash away enough sediment to expose the roots of trees. I check out the sky (gray clouds gathering) and look for high ground. The vertical walls of the canyon look back. I’m doomed. In places, we skirt boulders the size of Volkswagon Beetles or larger. I envy Blaine his ability to read these rocks. “See,” he says, “this rock is made up of older rocks that have been cemented together to form a conglomerate.” This particular conglomerate is just a baby rock if you can wrap your mind around geologic time. 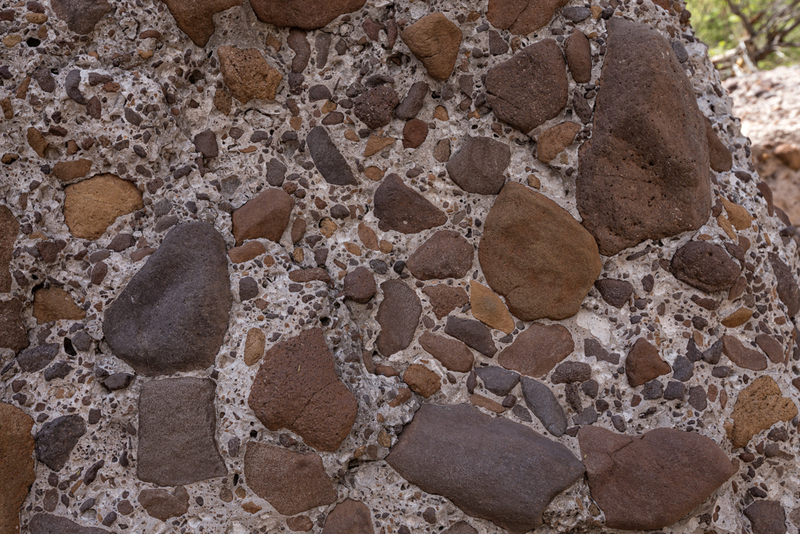 All of the “clasts” or smaller rocks that make up the conglomerate are volcanic in origin which means they were deposited about 27 million years ago. Over time, they broke away from their parent rock, were tumbled and smoothed, and came to rest in one place long enough for the white matrix rock to cement them all together again. The conglomerate eventually broke up, and Volkswagon-sized boulders tumbled down the slope, coming to rest in the stream bed. After about 3.5 hours of walking and stopping to admire rocks, plants, and scenic views we reach the end of the canyon. At this time of year, Mexicano Falls is more of a drip than a fall. Maidenhair ferns, yellow-flowered columbines, and thick carpets of moss fill the cracks where water seeps from the rocks. The plunge pool is thick with green algae. Blaine points to a gap in the canyon rim where water funnels through to create a waterfall during the summer rainy season. I’d love to be there to see the waterfall, but then I remember those exposed roots and the flood debris wrapped three to four feet high up the trunks of the trees that we were walking through earlier. Flash floods are real and dangerous in this canyon. While Blaine and I photograph the ferns and columbines, Roy walks the face, scouring the seeps for fringed monkeyflower (Mimulus dentilobus). “Found it!” he calls. Fringed monkeyflower is a rare plant in Texas, found only in places where water drips from the West Texas mountains. I’m surprised by how tiny it is. The bright yellow flower with its fringed petals and red spots in its throat rises above a mat of small leaves hugging the wet rock face. We’re lucky to find these in bloom. It’s only March and according to the field guides, fringed monkeyflower blooms from June to August. The wind begins to blow, and the clouds build, getting thicker and grayer. We decide to return to the truck before a storm drenches us. The hike back takes about 2.5 hours. We quickly pack up and drive off, but Blaine stops almost immediately. He walks around the truck and discovers a flat tire. “That’s two this week,” he mutters. 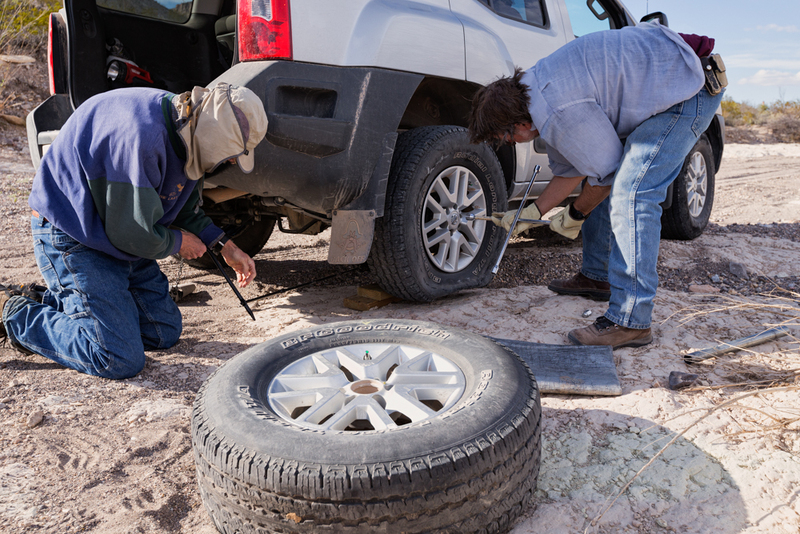 Razor-sharp rocks can slice through the sidewalls of a tire and mesquite thorns pierce treads easily. We unload all the gear to access the spare, and Blaine and Roy begin the laborious task of changing the tire. Fortunately, nothing goes wrong and within 30 minutes we’re back on the road. We eliminate a couple of side trips and head straight back to the park headquarters at Sauceda. Driving any further than necessary without a spare is foolish. Since Blaine and Roy have the flat-tire situation in control (and they’re a bit annoyed with my photographic documentation of the event), I wander off a few feet to photograph a patch of Big Bend bluebonnets with the flatirons of the Solitario in the background. The Solitario is a massive igneous dome created when molten rock pushed up the flat-lying rocks above it creating a circular feature 10 miles in diameter. The dome attracts geologists, botanists, and naturalists from around the world and is probably the most famous feature in Big Bend Ranch State Park. I love going to the Solitario, but this opportunity to explore Arroyo Mexicano with Blaine and Roy was as close to perfect as a day could be. This entry was posted in Chihuahuan Desert, Geology, Plants, Texas and tagged Arroyo Mexicano, Big Bend Ranch State Park, Chihuahuan Desert, Mimulus. Oh yes, the type of trip I would love to take someday – thanks for posting your adventure. I would love to see a “Monkeyflower”, I thought the photo of Charro wonderful, and will look for the book on “rare plants” in Big Bend NP. Enjoyed the blog post. Thank you, Keith. It’s definitely worth the trip. Cathy, Blaine forwarded your wonderful post. Great photos and commentary. Can’t wait to see BBRSP. I’m so glad you enjoyed it, Linda. You definitely need to take some time and come visit. Blaine is a wonderful guide! Sign up to receive an email about new blog content. That's all your email will be used for. I promise! © Cathryn A. Hoyt and Chihuahuan Desert Details, 2014. Unauthorized use and/or duplication of this material without express and written permission from this blog's author and/or owner is strictly prohibited. Excerpts and links may be used, provided that full and clear credit is given to Cathryn A. Hoyt and Chihuahuan Desert Details with appropriate and specific direction to the original content.